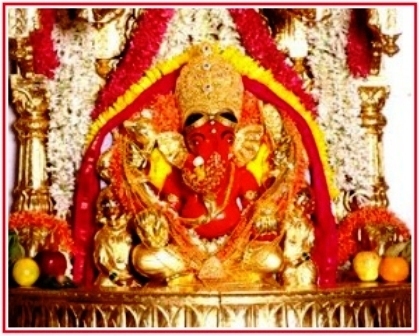 "Shree Siddhivinayak Ganapati Mandir", the temple of Lord Ganesha, is located in Prabhadevi at a short distance from Dadar, Mumbai. “Lord Siddhivinayak” is well known as “Navasala Pavnara Ganapati” among admirers. The Siddhivinayak temple was originally built by Laxman Vithu and Deubai Patil, 200 years ago. It has a small hall. The wooden doors to the sacred place are carved with images of the Ashtavinayak. The inner roof of the sacred place is plated with gold, and the central statue is of Ganesh.